The remains of 14 more people have been found in and around a Northern California town overrun by flames from a massive wildfire, officials said on Saturday, raising the death toll to at least 23. Maclean said no details were immediately available about the circumstances of the deaths and that the victims' badly burned condition would make identification difficult. "Our firefighters have been facing some extreme, tough fire conditions that they said that they've never seen in their lives," said Los Angeles County Fire Chief Daryl Osby. Two bodies were discovered in the community on Saturday but it was too early to determine if they died from the Woolsey fire or another cause, Los Angeles County Sheriff's Department officials said. Trump, a Republican, blamed California officials for fires on Saturday and threatened to withhold funding, saying the state should do more to try to prevent wildfires. “There is no reason for these massive, deadly and costly forest fires in California except that forest management is so poor,” the US president tweeted. 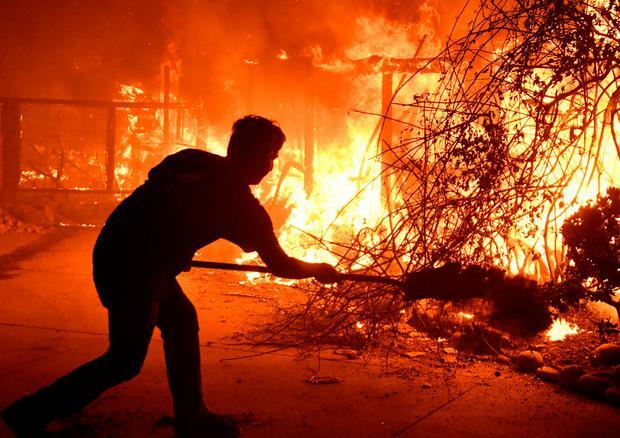 "Our focus is on the Californians impacted by these fires and the first responders and firefighters working around the clock to save lives and property - not on the President's inane and uninformed tweets," said Evan Westrub, a spokesman for California Governor Jerry Brown.